Previous studies showed that HLA-E was expressed in lymphoblastoid cell line (LCL) 721.221 cells, but surface expression was lacking. To determine the signals controlling surface expression, we constructed a series of hybrid genes using complementary portions derived from the HLA-E and HLA-A2 genes. In this manner, a hybrid of HLA-E was identified, designated AEH, which differed from HLA-E by having the HLA-A2 signal sequence substituting for the HLA-E leader peptide. Transfection of LCL 721.221 cells with AEH induced HLA-E surface expression. Analysis of peptides bound to HLA-E revealed that a nonamer peptide derived from the A2 signal sequence was the predominant peptide bound. LCL 721.221 cells transfected with certain class I genes, including HLA-G, were also sufficient to promote peptide binding and HLA-E surface expression without increasing the level of HLA-E heavy chain synthesis. Peptides bound to HLA-E consisted of nine amino acids, with methionine at position 2 and leucine in the carboxyl-terminal position, and were nearly identical to the leader sequence-derived peptide previously shown to be a predominant peptide bound to the murine Qa-1 Ag. Signal peptides derived from certain HLA-B proteins with threonine in position 2 only marginally up-regulated HLA-E surface expression in .221 cells. An examination of HLA-E peptide binding in the TAP negative cell line .134 indicated that peptide binding to HLA-E was dependent on a functional TAP heterodimer regardless of whether peptide was available in cis, as in the AEH construct, or in trans, as in the class I transfectants of .221 cells. The human HLA class I gene family includes three highly polymorphic transplantation molecules, HLA-A, -B, and -C, which are ubiquitously expressed and are able to present intracellular peptides to cytotoxic T cells, enabling the process of immune recognition (1, 2). Three additional class I genes, HLA-E, -F, and -G, commonly referred to as nonclasssical or class Ib genes, all highly homologous to the transplantation Ag genes and all of which associate with β2m, complete this gene family (3, 4). Intracellular transport and cell surface expression of class I proteins are dependent on the availability of peptides within the endoplasmic reticulum (ER)4 (5, 6, 7). The restricted expression of HLA-G in placental extravillous cytotrophoblast cells has inspired much of the current focus on this Ag, while HLA-F has been left largely unstudied and relatively few serious analyses of HLA-E structure and function have been conducted. The HLA-G protein appears to be expressed in at least two forms in the placenta, a membrane-bound form and a soluble form (8), and there appears to be low allelic polymorphism at this locus, although this issue remains to be settled (9). Both the soluble and membrane HLA-G proteins bind a diverse array of peptides, in a manner similar to that found for classical class I molecules (10, 11). These findings suggested that HLA-G plays a significant role in the maternal-placental immune interaction (12). Although no unique function has yet been assigned, the HLA-E gene sequence appears to have been highly conserved in primate evolution (13), and the limited polymorphism present at this locus may predate that found at the transplantation Ag loci (14). While HLA-E has not yet been implicated in any specific functional response, the patterns of HLA-E mRNA expression (3) and the high level of sequence conservation predicted a unique involvement of HLA-E in the immune response. Structural studies of the Qa-1 Ag in the mouse have shown that residues involved in the peptide binding cleft are distinct from the murine classical class I Ags at two key positions (15). The serine residues at these positions in Qa-1 are shared by HLA-E, suggesting that these molecules may associate with structurally similar peptides (16). Qa-1 can present a TAP-dependent leader peptide derived from the H-2D class I protein to alloreactive T cells (17) and may be involved in specific deletion of autologous CD4+ T cells expressing Vβ8 TCR (18). It was previously shown that LCL 721.221 cells express HLA-E intracellularly; however, surface expression was lacking (18). To gain insight into the signals controlling surface expression of HLA-E, we constructed a series of hybrid genes using complementary portions derived from the HLA-E and HLA-A2 genes. We identified a hybrid of the HLA-E gene, called AEH, which apparently directed the expression of the HLA-E Ag on the cell surface. Biochemical analysis showed both the endogenous HLA-E and AEH-derived heavy chains had identical structures and were present in essentially equal amounts in the transfectants. Further studies showed that AEH had the characteristics of a class I protein that had bound peptide, while endogenous HLA-E apparently lacked significant bound peptide. A direct examination of peptides bound to E and AEH confirmed this difference and revealed that a nonamer peptide derived from the A2 signal sequence was the predominant peptide bound to AEH. Analysis of HLA-E-bound peptides in .221 cells transfected with HLA-A2 or other class I genes showed that the presence of these gene products in trans was sufficient to promote HLA-E peptide binding and surface expression. The nonamer peptides bound to HLA-E are strikingly homologous to the leader sequence-derived peptide previously shown to bind to the murine Qa-1 Ag. These findings are discussed in terms of their importance to classical class I peptide binding and HLA-E Ag expression. LCL 721.221 (19), derivative cells transfected with HLA-Cw0401, -Cw1502, -G1, and -Gs, and LCL .134 and 2C2 (TAP reconstitution of .134 (5)) were maintained in RPMI 1640 medium supplemented with 10% (v/v) FCS, 2 mM l-glutamine and 1 mM sodium pyruvate. Cells transfected as described (19), with either HLA-E, AEH, A2, or B27 were cultured in the presence of hygromycin B (Calbiochem, La Jolla, CA) in the medium at 200 mU/ml. All cultures were maintained in 5% CO2 at 37°C. The 5.1-kb HindIII fragment containing the HLA-A2 gene (20) and the 6.2-kb HindIII fragment containing the HLA-E gene (3) were used as sources of DNA. Hybrid AEH was constructed by ligating the 530-bp HindIII-HphI fragment from the HLA-A2 gene to the HphI-EagI and the EagI-HindIII fragments from the HLA-E gene to yield AEH. The hybrid construct was restriction mapped to verify its integrity. To confirm that this construct directed the expression of the anticipated spliced mRNAs, primers from the 5′ leader and 3′ untranslated regions of HLA-E (14) and HLA-A2 specific 5′ and 3′ region primers were used in pairwise combinations to amplify cDNA derived from reverse transcribed RNA from the transfectant cell line. Restriction sites incorporated into the primers were used to clone the amplified material into M13 for sequence analysis (21). HLA-E-specific Abs were generated by immunization of HLA-B27 transgenic mice with HLA-E purified from AEH cells using a W6/32 immunoaffinity column. After immunizations, three fusions yielded six hybridomas producing HLA-E-reactive Abs as assessed by FACS analysis of .221-AEH cells, two of which were characterized more extensively. After consecutive subclonings of hybridomas, Abs 3D12 (IgG1) and 7G3 (IgG2b) were tested in immunoprecipitations of HLA-E from a panel of LCLs collectively expressing a large diversity of HLA-A, -B, and -C Ags, followed by isoelectric focusing of the bound protein. Western analysis was performed using gel conditions that resolved the HLA-E heavy chain (which is about 2 kDa smaller than the classical Ags) from the HLA-A, -B, and -C molecules. To test for HLA-G cross-reactivity, .221-G1 cells that also express HLA-E, were tested in the same manner. Cumulatively, these analyses showed that both Abs specifically bound the HLA-E heavy chain without cross-reactivity with other class I. An examination of immunoprecipitated HLA-E on 15% SDS-PAGE demonstrated that Ab 3D12 was able to immunoprecipitate both the HLA-E complex and free heavy chain, while 7G3 reacted only with the free heavy chain. Other Abs used in this report include mAbs W6/32 (monomorphic HLA class I, obtained from the American Type Culture Collection (ATCC), Rockville, MD), 87G (HLA-G-specific (10)), PA2.1 (HLA-A2-specific, obtained from ATCC), and rat monoclonal 7G6.2 (HLA-E reactive obtained from Susan Radka, Regeneron Pharmaceuticals, Tarrytown, NY). An amount equal to 5 × 105 cells per well of 96-well microtiter plates was washed once with ice-cold PBS containing 1% FCS, 0.1% NaN3. LCL 721.221 cells transfected with HLA-E or AEH were incubated with 100 μl of W6/32 or 3D12 at 30 μg/ml for 30 min on ice. Cells were washed 3× with ice-cold PBS-FCS and then incubated with 50 μl FITC-conjugated goat anti-mouse Ig-specific Ab (Tago, Burlingame, CA) at a concentration of 23.4 μg/ml for 30 min on ice. After three washes with PBS-FCS, cells were fixed with 100 μl of 1% paraformaldehyde in PBS. Samples were analyzed on a FACScan flow cytometer (Becton Dickinson, Mountain View, CA). .221-E and .221-AEH cells were metabolically labeled with [35S]methionine as described (10). Briefly, cells at a density of 2 × 106 cells/ml were preincubated in methionine-free RPMI 1640 medium, followed by incubation for 30 min at 37°C, and 25 μCi of [35S]methionine (Trans 35S-Label, ICN Radiochemicals, Costa Mesa, CA) (1143 Ci/mmol) for 4 h at 37°C. At the end of labeling, the medium was removed immediately by centrifugation, and cells were washed twice with RPMI 1640 medium and chased with complete medium for 30 min. Cells subjected to endoglycosidase digestion were labeled with [35S]methionine for 6 h and chased for 2 h.
Cells were lysed and immunoprecipitated as described previously (22) with slight modification. After incubation on ice for 30 min, the lysate was centrifuged at 10,000 × g for 15 min at 4°C, and the supernatant was collected. To 1 ml of this lysate was added 10 μl of mouse serum (Sigma, St. Louis, MO) and mixed continuously at 4°C for 4 h. Eighty microliters of a 50% suspension of formalin-fixed Staphylococcus aureus (Pansorbin, Calbiochem) in PBS was added and incubated overnight. Following centrifugation, the supernatant was adjusted to 0.1% SDS and 5 mg/ml BSA (final concentration), and 15 μl of W6/32 (2.2 mg/ml) was added. After continuous gentle mixing at 4°C for 2 h, 35 μl of a 50% suspension of prewashed protein A-Sepharose (Sigma) in buffer A (0.5% Nonidet P-40 and 5 mg/ml BSA) was added and incubated at 4°C for 4 h. The immune-complex was washed twice in buffer A, 3× in buffer B (0.5% Nonidet P-40, 5 mg/ml BSA, 0.5 M NaCl, 10 mM sodium phosphate, pH 7.4), once in buffer B but omitting BSA, and analyzed by SDS-PAGE. Endoglycosidase digestions were conducted at 37°C for 16 h in a total volume of 40 μl. The following enzyme concentrations and buffers were used: Endo-β-N-acetylglucosaminidase (endo H) (Genzyme, Cambridge, MA), 10 mU, in 100 mM sodium citrate, pH 6.0, containing 0.1% BSA and 0.1% SDS; peptide N-glycosidase F (PNGase F) (Genzyme), 500 mU, in 100 mM phosphate buffer, 0.1% BSA, 0.1% SDS, 0.1% Nonidet P-40, 10 mM EDTA and 10 mM β-mercaptoethanol. Both enzyme digestions were terminated by boiling the incubation mixture for 5 min. Samples were analyzed by 11% SDS-PAGE and visualized by autoradiography. Digestion with neuraminidase (type VI, from Clostridium perfringens, Sigma), 1 U, was conducted at 37°C for 5 h in 50 mM EDTA, pH 7.0. At the end of digestion, neuraminidase was removed by washing the digestion mixture with PBS containing 0.5% Nonidet P-40. Radiolabeled proteins were solubilized in 50 μl of isoelectric focusing (IEF) sample buffer (9.5 M urea, 2% Nonidet P-40, 5% ampholine, pH 3.5–10, 0.1 M DTT) at room temperature for at least 2 h and then analyzed by one-dimensional IEF with ampholines of pH 3.5 to 10, (1.7%), pH 5 to 7 (1.3%), and pH 6 to 8 (1.3%). Cells were lysed and total protein was isolated and separated on a 10% SDS-PAGE gel and electroblotted as described (10). Protein was detected by Ab 7G3 for HLA-E and AEH followed by horseradish peroxidase-labeled goat anti-rat IgG (Fisher Biotech, Pittsburgh, PA) at 1:6000 dilution, and finally with an enhanced chemiluminescence system (ECL, Amersham, Arlington Heights, IL). Densitometry was performed by scanning the x-ray film with a Sharp JX-320 scanner. HLA-E was purified from the detergent lysate of .221-AEH, .221-A2, and .221-G1 cells. Briefly, 20- to 50-g cell pellets of cultured cells were washed with PBS and mixed with an equal volume of solubilization buffer containing 2% Nonidet P-40, 0.8 M NaCl, 20 mM Na2EDTA, 2 mM PMSF, 100 mM iodoacetamide, pepstatin A (10 mg/ml), leupeptin (10 mg/ml), and aprotinin (5 mg/ml) in PBS. The cells were gently agitated for 30 min at 4°C, nuclei removed by low-speed centrifugation at 1500 × g for 5 min at 4°C, and the total protein concentration adjusted to 2 mg/ml. The cell lysate was clarified by centrifugation at 100,000 × g, for 90 min. The HLA-E-derived complexes were then purified by immunoaffinity chromatography using mAb W6/32 coupled to CNBr-activated Sepharose 4B. MHC complexes were eluted with 1% trifluoroacetic acid (TFA), peptides recovered by ultrafiltration using an Amicon cell with a 10,000 m.w. cut-off, and concentrated by vacuum centrifugation. Peptides were purified on a model 140B narrow-bore HPLC system (Applied Biosystems, Foster City, CA) using a 1 × 100-mm C18 Vydac column at a flow rate of 100 μl/min at 40°C. Linear acetonitrile gradients from solvent A (0.1% TFA) to solvent B (0.085% TFA in acetonitrile) were used for elution. HLA-E from .221-G1 and .221-A2 cells was purified by W6/32 immunoaffinity chromatography as described above except the detergent solubilized cell lysates were precleared with 87G and PA2.1 affinity columns, respectively. No peptides were recovered from cell lysates of nontransfected .221 cells purified by W6/32 immunoaffinity chromatography. Automated sequence analysis was performed in a pulsed liquid protein sequencer (model 476A, Applied Biosystems), as described (23). Proteins were recovered from SDS-polyacrylamide gels by electroblotting onto a Problott membrane (Applied Biosystems), and quantitation was based on amino acid sequence analysis. Peptides were sequenced on polybrene-coated glass fiber discs. Analysis of peptide mixtures was performed by LC/MS and LC/MS/MS on a Finnigan TSQ 7000 (San Jose, CA) equipped with an electrospray ionization source. The pumping system was modified by exchanging the original Edwards RV8 (100 l/min) forepump for an Alcatel 2021A (300l/min) pump. For electrospray ionization the needle voltage was set at 2.0 kV. The tip of the probe was positioned to within 0.5 cm of the heated capillary orifice, which was held at 150°C. The sheath liquid was delivered at 1 μl/min and consisted of a 7/3/0.0125 mixture of methanol/water/acetic acid (v/v/v). Nitrogen was used as a sheath (70 psi) and auxiliary (5 units) gas. For LC/MS analysis quadrupole one was scanned from 300 to 1400 u at a rate of 500 u/s throughout the HPLC gradient. For sequence analysis, quadrupole one continuously selected only the protonated molecular ion of choice ((M + 2H+)2+ ± 1 u) and quadrupole three continuously scanned from 50 to (M + H+)+ u at a rate of 500 u/s to record the m/z of the fragment ions. An argon pressure of 3.0 mtorr and collision energy of (M + 2H+)2+/−27 was used for collision activated dissociation (CAD). Separation of peptides was conducted by microcolumn HPLC, as previously described (24). Peptides were eluted from a column (50 μm by 15cm) packed with POROS 10 R2 (20 μm; PerSeptive Biosystems, Cambridge, MA) at a flow rate of 0.3 μl/min with a 15-min gradient of 0.5% acetic acid to 80% acetonitrile. .221-E cells were seeded in 24-well plates at 5 × 105 cells/ml. After 32 h at 25.5°C, peptides solubilized in DMSO were added into the culture to a final concentration of 200 μM and incubated at the same temperature for another 15 h. After 5 h at 37°C, cells were pelleted, washed, and processed for FACS staining. In previous studies of HLA-E expression, it was shown that HLA-E protein was immunoprecipitated with W6/32 from 721.221 cell lysates, but no protein appeared on the cell surface (25). To investigate the reasons for this, we attempted to map the domains responsible for this pattern of expression by constructing hybrid genes with exons from the HLA-A2 gene, replacing complementary portions from the HLA-E gene, cloning them into the pHEBo vector, and transfecting into the class I-deficient cell line .221 (19). Our criteria for choosing a hybrid construct for further study was the detection of cell surface expression of the HLA-E protein, as assayed by FITC-labeled W6/32 staining. In this regard, one hybrid proved to be most interesting (Fig. 1⇓A). Construct AEH consists of the HLA-A2 promoter sequence through the end of exon 1 encoding the leader peptide, fused to the HLA-E intron 1 sequence, and extending beyond the HLA-E 3′ untranslated sequence. Hybrid genes and their derived proteins constructed from combinations of the HLA-E gene and complementary portions of the HLA-A2 gene. A, Cartoons representing the genomic HindIII fragments subcloned into the pHEBo vector. Filled bars represent HLA-E genomic sequence and gray bars represent HLA-A2 genomic sequence. B, Relevant sequence, translated into amino acid sequence, of the exon 1-exon 2 junction is shown. This sequence was deduced from mRNA isolated from transfectants, reverse transcribed into cDNA, and sequenced as described in Materials and Methods. C, Expression of normal and hybrid genes in transfected .221 cells. HLA-E (E) and -AEH (AEH) transfectants were stained with mAb W6/32. Solid lines trace the fluorescence of transfected cells and thin lines of the untransfected .221 cells stained with the same Ab. To ensure that the hybrid constructs were expressing the predicted spliced mRNAs, RNA from two transfectants was isolated and the HLA-E and A2 specific sequences were as described in Materials and Methods. This analysis showed that in the hybrid transfectant, the exon 1 sequence was correctly spliced to the exon 2 sequences, resulting in the desired hybrid mRNA (Fig. 1⇑B). Northern analysis on RNA derived from each of the two transfectants showed high levels of each of the transcripts present, and the hybrid transcripts were of a size corresponding to class I mRNA (not shown). In this manner, we succeeded in identifying a hybrid of the HLA-E gene, referred to in this report as AEH, which directed cell surface expression of the HLA-E Ag (Fig. 1⇑C). To rule out trivial explanations for AEH surface expression, we made a detailed comparison of the E and AEH proteins. First, SDS-PAGE analysis of the HLA-E and AEH proteins expressed in .221 transfectants and immunoprecipitated wtih W6/32 Ab was performed. The m.w. of the HLA-E heavy chain from both transfectants was indistinguishable in size and, when equal amounts of protein were combined and loaded, a single band was observed. In addition, isoelectric focusing of the proteins revealed no differences (Fig. 2⇓A). Taken together, these results demonstrated that these proteins did not differ in size or charge and that any potential differences would be restricted to one or a few amino acid residues at the N terminus. As a final measure of identity, amino acid sequence analysis was performed on the first 12 residues of each protein indicating that the E and AEH mature protein heavy chains had identical N termini. The HLA-A2 signal sequence does not alter the primary sequence or amount of the processed HLA-E protein but does change sensitivity to endo H. Class I protein was immunoprecipitated with mAb W6/32 followed by (A) SDS-PAGE analysis and IEF analysis. Protein from .221 cells and the indicated transfectants or equimolar quantities of the two proteins were run as indicated above each lane. Counts applied were adjusted to obtain a visible band. B, The HLA-A2 signal sequence does not affect the quantity of HLA-E heavy chain synthesized in the hybrid transfectant (AEH) as compared with the .221-E transfectant (E). HLA-E and -AEH heavy chains were visualized by Western blot using Ab 7G6.3, and expression levels were quantified by densitometry (bar graph). C, The HLA-A2 signal sequence directs the HLA-E protein into an endo H-resistant form. Cells were labeled with [35S]methionine for 15 min and chased with unlabeled methionine and immunoprecipitated with mAb W6/32. The immunocomplexes were loaded untreated or were incubated with endo-β-N-acetylglucosaminidase (endo H), peptide N-glycosidase F (PNGase F) before loading. Protein was separated by 11% SDS-PAGE and visualized by autoradiography. Although both E and AEH transfectants apparently produced heavy chains that, after signal peptide cleavage, were identical, the possibility remained that quantitative differences between the E and AEH protein might be responsible for the difference in cell surface expression. To address this explanation, Western blot analysis of total protein from .221-transfectants with rat Ab reactive with HLA-E was performed (Fig. 2⇑B). Densitometry of the signals in both the E and AEH transfectants showed clearly that overall protein levels were not significantly affected by the hybrid constructs. Apparently neither the E nor the A2 promoter or signal sequence had any effect on the quantity of protein synthesized, a finding consistent with other studies using the pHEBo vector and .221 (19). Given that the E and AEH heavy chains were structurally identical, we proceeded to investigate differences in Ag processing by analyzing for sensitivity to endo H treatment. Resistance to endo H digestion has been shown to be correlated to the binding of peptide to class I and subsequent transport to the cell surface (7). Also, in TAP-deficient mutant cell lines, which have a defect in the transport of peptide to the ER, HLA-B5 is not expressed on the cell surface and is largely endo H sensitive (5, 6). Protein was labeled with [35S]methionine and chased for 4 h, and the immunoprecipitates were subjected to endo H digestion. Figure 2⇑C shows that about half of the AEH-derived protein was endo H resistant, whereas none of the E-derived protein was resistant. Complete digestion of both proteins was possible with PNGase F, which indicated that E and AEH were glycosylated as N-linked glycoproteins in a manner similar to other class I. These results established endo H resistance as a second difference between E and AEH, in addition to the difference in cell surface expression, and strongly suggested that the fundamental difference was due to the presence of bound peptide in the AEH complex and the corresponding lack of peptide in the E complex. Because the .221-AEH transfectant expressed only HLA-E, we used immunoaffinity chromatography with Ab W6/32 to isolate the complex. The recovery of HLA-E from .221-AEH cells was 530 pmol/1.3 × 1010 cells. The naturally processed peptides were released from the immunoaffinity-purified complexes by acid extraction, and the AEH-derived peptides were purified by rpHPLC (Fig. 3⇓). Numbered peaks in this chromatogram were directly analyzed by Edman degradation. Peaks 8 and 9 contained a complex mixture of free amino acids and dipeptides; peaks 12 and 13 consisted of peptide VMAPRTLVL, in the nonoxidized and oxidized forms, which together comprised 62% of the HLA-E complex recovered. HPLC profile of eluted peptides from .221-AEH transfectants. A linear elution gradient with acetonitrile is indicated by a dashed line, and the percentages are presented on the right ordinate. UV absorbency is indicated on the left ordinate. Individual peaks that were sequenced are indicated. The arrow indicates the elution position of synthetic HLA-A2 leader peptide (VMAPRTLVL). From the sequence it was clear that the major peptide bound to HLA-E in .221-AEH cells was derived from the fused A2 leader sequence, and apparently accounted for HLA-E surface expression. The nonamer represents residues 3 to 11 of the A2 signal sequence (Fig. 1⇑A). To determine whether this was a consequence of the artificial nature of the hybrid construct or whether these observations predicted de novo HLA-E peptide binding, we examined HLA-E expression in .221 cells transfected with HLA-A2. The .221 cells do in fact naturally express endogenous HLA-E at levels about 10-fold lower than the transfectant. Therefore, it was possible that an examination of the endogenous HLA-E in a .221-A2 transfectant might bind peptide if the A2-derived signal sequence was available in trans. In addition, to gain further information about how general HLA-E peptide binding might be, we examined HLA-E expression in .221-G1 transfectants. HLA-G has a signal sequence similar to that of HLA-A2, including a nonamer (VMAPRTLFL) differing by a single amino acid at position 10. Because HLA-E-specific reagents were not available at the time these experiments were performed, we partially depleted the HLA-A2 or the HLA-G complex from .221-A2 and .221-G1 cell lysates, respectively, with monoclonals specific for A2 (PA2.1, ATCC) or G (87G, 10 and used Ab W6/32 in a second chromatography step to isolate the remaining class I complex. Sequence analysis demonstrated that the protein isolated from a W6/32 immunoaffinity column was a mixture of HLA-A2 and -E, or HLA-G and -E, in an approximately 10 to 1 molar ratio in both cases. To identify the A2 leader peptide (VMAPRTLVL) presented by HLA-E in .221-A2 cells, we purified the cell lysate on a W6/32 affinity column, following partial preclearing of HLA-A2 molecules with Ab PA 2.1. The acid-released peptides were separated by narrow bore rpHPLC (HPLC profile not shown), and the fraction that coeluted with the synthetic A2 leader peptide was screened for the presence of the natural peptide by amino acid sequence analysis, LC/MS, and CAD analysis (26). Edman degradation identified in fraction 25 the amino terminal residues VMAP of the A2 leader peptide; the recovery of this peptide was 6 pmol from 1.9 × 1010 .221-A2 cells. No attempt was made to identify the oxidized peptide (see Fig. 3⇑). CAD analysis was performed on the (M + 2H+)2+ ions with m/z of 500 of the A2 leader peptide and compared with the mass spectrum of the synthetic A2 peptide (Fig. 4⇓A). All the possible b- and y-fragment ions are shown above the figure. Because of the presence of the very basic residues proline and arginine at positions 4 and 5, not all the fragment ions were observed. Coelution experiments, Edman degradation, and CAD analysis, however, defined the sequence of the A2 leader peptide unequivocally. The A2 leader peptide was not present in the HLA-A2-purified peptides, consistent with the HLA-A2.1-predicted motif (28) and confirming that this peptide is presented by HLA-E and not by HLA-A2. Mass spectra of HLA-E-associated peptides. A, Comparison of CAD mass spectra of synthetic HLA-A2 leader peptide and a sample of rpHPLC fraction 25 (A2 Natural) from .221-A2 cell lysates purified by mAb W6/32 affinity chromatography. Spectra were acquired under identical conditions with quadrupole 2 set to pass (M + 2H+)2+ ions at m/z = 500. 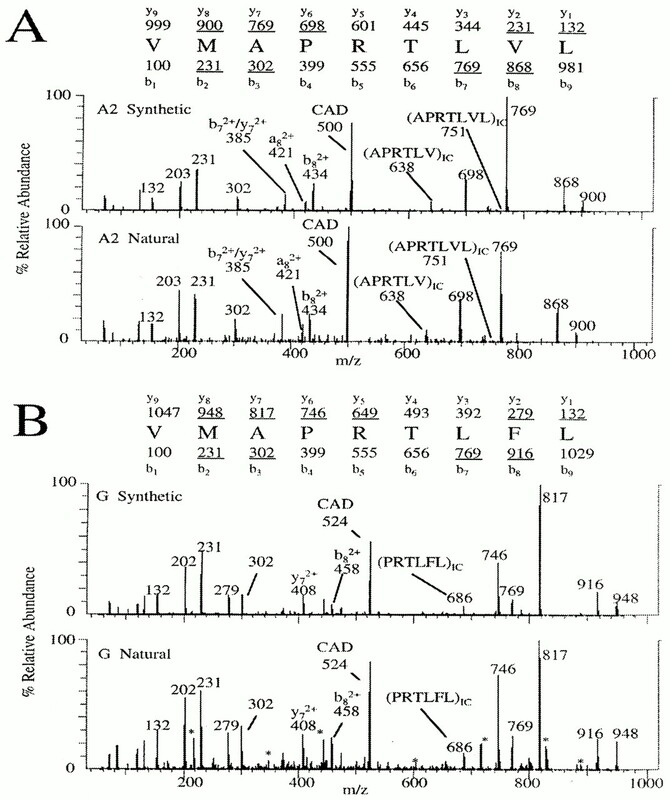 B, Comparison of CAD mass spectra of synthetic HLA-G leader peptide and a sample of rpHPLC fraction 30 (G Natural) from .221-G1 cell lysates purified by mAb W6/32 affinity chromatography. 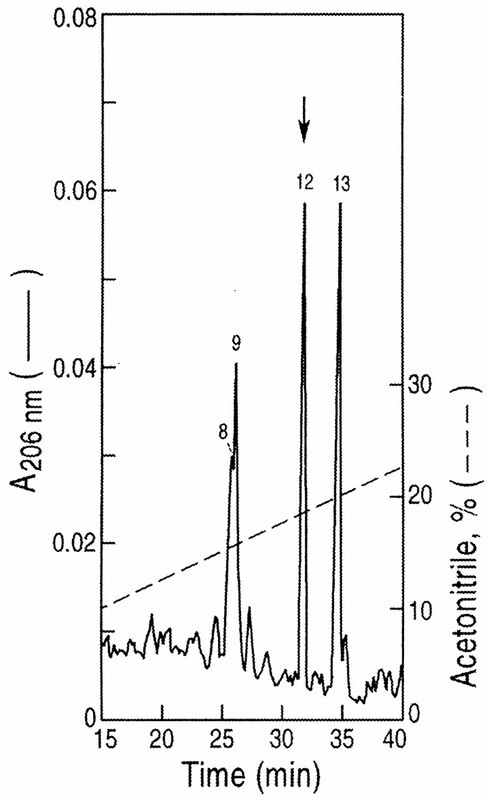 Spectra were acquired under identical conditions with quadrupole 2 set to pass (M + 2H+)2+ ions at m/z = 524. Internal cleavages that produce a new b-ion series starting at a residue other than the original amino terminus are in parenthesis with the subscript IC. The sequence of the synthetic peptides, annotated according to standard nomenclature (27), are shown above the spectra. Ions observed in both A and B are underlined. Signals present in B and marked with * are from another peptide at m/z = 524 entering the collision cell simultaneously with the G leader peptide. The same approach was taken to identify the G leader peptide (VMAPRTLFL) presented by HLA-E in .221-G1 cells. Edman degradation identified in fraction 30 (HPLC profile not shown) the amino terminal residues VMAPRTL of the G leader peptide; the recovery of this peptide was 5 pmol from 1.0 × 1010 .221-G1 cells. CAD analysis was performed on the (M + 2H+)2+ ions with m/z of 524 of the G leader peptide and compared with the mass spectrum of the synthetic G peptide (Fig. 4⇑B). Coelution experiments, Edman degradation, and CAD analysis defined the sequence of the HLA-G leader peptide. This peptide was also present in the HLA-G-purified peptides, as shown by LC/MS and LC/MS/MS analysis (data not shown), suggesting that HLA-G and HLA-E may bind peptides with similar binding motifs (10). The amount of A2 and G leader peptide expressed on cells was determined from the recovery yields of these peptides. The typical yields of the A2 peptide from 1.9 × 1010 .221-A2 cells was 6 pmol and of the G peptide from 1.0 × 1010 .221-G1 cells was 5 pmol. Assuming a 5% overall peptide recovery (the hydrophobicity of these peptides results in disproportionate losses during affinity purification; only 50% of the total leader peptide coeluted with the unoxidized synthetic peptide and was quantitated), this corresponds to approximately 4000 to 6000 peptide-HLA complexes per cell. The calculated number of HLA-E complexes per cell is in agreement with the recovery of HLA-E heavy chain, determined by amino acid sequence analysis of electroblotted protein, suggesting that the A2 and G leader peptides are the predominant peptides bound to HLA-E in .221-A2 and .221-G1 cells, respectively. HLA class I proteins promote HLA-E surface expression. During the course of these studies, we had been attempting to isolate monoclonals specific for HLA-E and were ultimately successful (see Materials and Methods). The specificity of these Abs was stringently tested for cross-reactivity with other HLA class I molecules. Abs 3D12 and 7G3, used in the studies described below, were tested by immunoprecipitation of HLA-E from a panel of LCLs collectively expressing a large diversity of HLA-A, -B, and -C Ags, followed by isoelectric focusing of the bound protein. Western analysis was performed using gel conditions that resolved the HLA-E heavy chain (see Materials and Methods) from the HLA-A, -B, and -C heavy chains. To test for HLA-G cross-reactivity, we included .221-G1 cells. Cumulatively, these analyses showed that both Abs specifically bound the HLA-E heavy chain without cross-reactivity with other class I (data not shown). Further studies demonstrated that Ab 3D12 was able to immunoprecipitate the HLA-E complex and also binds the free HLA-E heavy chain, while 7G3 reacted only with the free heavy chain. Ab 3D12 was thus used in FACS analysis of .221-A2 and .221-G1 cells, which showed that HLA-E peptide binding was correlated with surface expression (Fig. 5⇓A). In addition, this up-regulation was not due to increases in the amount of HLA-E protein in transfectants over that seen in the untransfected counterpart, as demonstrated by Western analysis using equal numbers of cells (Fig. 5⇓B). Surface expression of endogenous HLA-E is induced by the introduction of some but not all HLA class I. A, FACS analysis of HLA-E expression in .221-A2, .221-G1, .221-Gs, .221-Cw0401, .221-Cw1502, and .221-B27 transfectants was performed using the HLA-E-specific Ab 3D12. The AEH transfectant was included for comparison. Thin lines show the staining of untransfected .221 cells using the same Ab. The .221 class I transfectants were constructed as described (29), using vector pLNCx cDNA constructs for HLA-G1, -Gs, -Cw0401, and -Cw1502, and the pHEBo vector (19) was used to direct expression of the HLA-A2 and -B27 molecules. HLA-C and -B expression was demonstrated by FACS analysis using W6/32 (not shown). B, Western analysis of the .221 HLA class I transfectants with mAb 7G3 demonstrated that the level of total HLA-E protein in the transfectants was unaltered from that detected in untransfected .221 cells. We next examined the generality of HLA-E peptide binding by performing FACS analysis with 3D12 on .221 transfectants expressing a further diversity of HLA class I (Fig. 5⇑). Two HLA-C alleles examined, Cw0401 and Cw1502, contained signal sequences with variation at position 8 of the nonamer, containing leucine and isoleucine, respectively. About half of the HLA-B alleles differ from most HLA-A and -C alleles at position 2 of the nonamer, containing a threonine rather than a methionine residue at that position. As a representative of this HLA-B group, we examined .221-B27 transfectants. In addition, we were curious about whether the soluble form of HLA-G (Gs), which contains a leader peptide identical to the membrane bound form (G1), would also up-regulate surface HLA-E, especially in light of the fact that the soluble HLA-G molecule, while dependent on TAP for peptide binding, did not associate with TAP in the same manner as do other HLA class I (10). 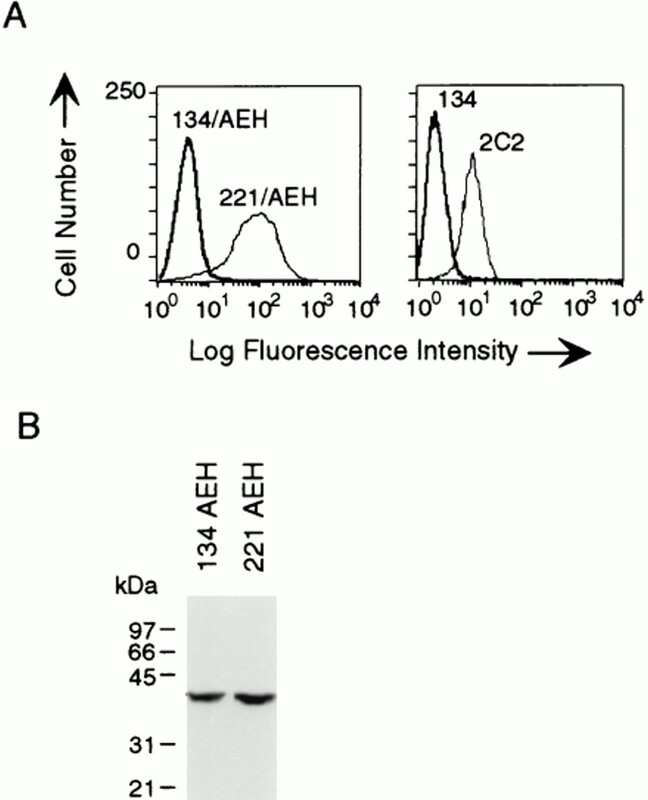 FACS analysis of these six transfectants with HLA-E-specific Abs is presented in Figure 5⇑A and compared with .221-AEH cells. The results suggested that HLA-E can bind peptide derived from a variety of HLA class I, but that a majority of HLA-B alleles do not contain the appropriate peptide. In addition, this up-regulation of HLA-E expression was not due to increases in the amount of HLA-E protein in transfectants over that seen in the untransfected counterpart, as demonstrated by Western analysis using equal numbers of cells (Fig. 5⇑B). Nonamers derived from HLA class I leader peptides promote HLA-E surface expression. As a final confirmation of HLA-E peptide binding, we tested the binding ability of several distinct nonamers derived from several HLA class I alleles to the endogenous HLA-E expressed in .221. Eight distinct peptides derived from common HLA alleles were tested, including the five analyzed by FACS of transfectants above (Fig. 5⇑) and, in addition, peptides derived from the HLA-A3, -B58 and -B65 leader sequences. The most common HLA-B allele variants are represented by the nonamer derived from HLA-B27, from B58, and from B65. Many of the HLA-B alleles differ from other class I by having a threonine at position 2 of the nonamer rather than methionine. The FACS data of .221-B27 above indicated that such a nonamer did not bind HLA-E in .221-B27 cells (Fig. 5⇑). The results from the peptide binding assay confirmed the binding of the HLA-A2, -G, -Cw0401, and -Cw1502 derived nonamers and indicated that the HLA-B27 nonamer binds relatively weakly (Fig. 6⇓). Further, the nonamer derived from HLA-B58 showed only slightly more affinity for HLA-E than the B27 derived nonamer, while the octamer from HLA-A3 showed no detectable affinity. Apparently not all HLA-B alleles fail to provide a suitable peptide for HLA-E binding, since VMAPRTVLL from HLA-B65 appeared to bind strongly to HLA-E. This peptide is present in about 40% of HLA-B alleles. These results suggest that peptides bound to HLA-E consist of 9 amino acids and have a strong anchor at the P2 methionine and the carboxyl terminal P9 leucine, while limited variability in residues 7 and 8 does not strongly affect peptide binding. Therefore, it can be predicted that the vast majority of HLA-A and -C proteins and approximately half of HLA-B alleles can provide peptides to the HLA-E allele expressed in LCL .221. Peptide binding assay. Comparison of peptide binding to HLA-E of distinct HLA class I leader peptides. LCL 721.221 cells transfected with HLA-E were incubated at 26°C, and peptide was added as described in Materials and Methods. HLA-E surface expression was measured by FACS analysis using Ab 3D12. a, .221 (thin line) and .221-AEH (black line) were incubated at 37°C and stained as negative and positive controls. b, VMAPRTLVL from HLA-A2, (c) VMAPRTLFL from HLA-G, (d) MAPRTLLL, 8-mer, (e) VTAPRTLLL from HLA-B27, (f) VTAPRTVLL from HLA-B58, (g) VMAPRTVLL from HLA-B65, (h) VMAPRTLLL from HLA-Cw1502, and (i) VMAPRTLIL from HLA-Cw0401. Solid lines are cells incubated with peptide at 25.5°C, and the thin lines result from .221 HLA-E-transfected cells incubated without peptide at the same temperature. Binding of class I leader peptides requires a functional TAP complex. Previous studies have shown that leader sequence-derived peptides are found bound to HLA class I, and that these peptides are delivered in a TAP-independent manner, the first example described being that of HLA-A2 (30). However, other studies, including that of the murine Qa-1 Ag which, as discussed below, has other clear parallels with HLA-E, have shown that some presumably ER-derived peptides bind to class I in a TAP-dependent manner (31). Consequently, we were motivated to determine whether peptide binding to HLA-E was TAP dependent or independent. We attempted to answer this question by constructing AEH transfectants of .134 cells, the TAP negative relative of .221 (6), and compared relative levels of HLA-E surface expression between the two lines. HLA-E surface expression and peptide available in trans was examined by comparing the .134 cell directly with its TAP-positive reconstitution cell line 2C2 (5), both of which express endogenous HLA-E and HLA-A2. 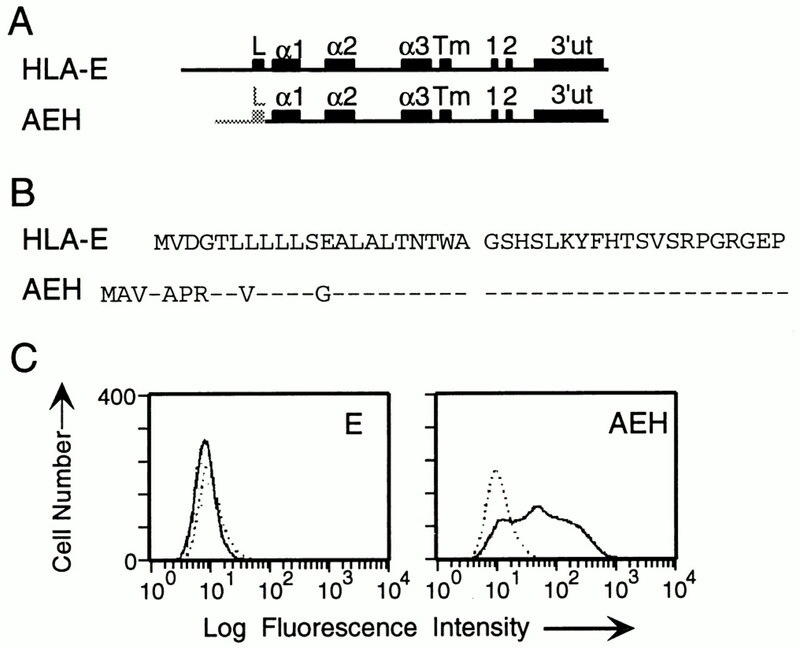 As shown in Figure 7⇓A, the AEH-derived HLA-E molecule was present on the surface of .134-AEH at levels well below that seen on .221-AEH, and the endogenous HLA-E in .134 was not detectable on the surface, while it appeared at normal levels on LCL 2C2. Overall levels of HLA-E were examined by Western analysis, which demonstrated that total HLA-E protein in the .221-AEH and .134-AEH transfectants were similar (Fig. 7⇓B). These results suggest that the nonamer derived from HLA-A2 binds to HLA-E only if a functional TAP complex is present, regardless of whether the peptide is supplied in cis, as part of the newly synthesized AEH protein, or in trans, from the endogenous HLA-A2 molecule. Peptide binding to HLA-E is dependent upon a functional TAP molecule regardless of whether the peptide is available in cis or in trans. A, The TAP-negative mutant .134 was transfected with the AEH construct (Fig. 1⇑A) and analyzed for expression of HLA-E by FACS analysis using Ab 3D12 (solid lines), and compared with HLA-E surface expression in.221-AEH cells (thin lines). LCL 2C2, the TAP positive reconstitution of .134 (5), was similarly compared with .134 to examine the effect of TAP on the expression of endogenous HLA-E. B, Western analysis of the .134-AEH transfectant demonstrated that the level of total HLA-E protein was similar to that found in .221-AEH cells. We have shown that a hybrid gene containing the HLA-A2 promoter and signal sequence and the HLA-E mature protein sequence can give rise to a mature protein identical in primary structure to that encoded by the HLA-E gene. The hybrid AEH gene differs from its unaltered counterpart in driving expression of an HLA-E protein that is expressed on the cell surface as a typical trimolecular class I complex with peptide derived from the fused HLA-A2 leader sequence. This result led us to investigate the possibility that the natural expression of HLA-E in cells depends upon the presence of other HLA class I molecules to provide peptide and subsequent assembly of the HLA-E complex. Our results demonstrated that the endogenous HLA-E protein in LCL 721.221 cells will bind a nonamer peptide derived from class I leader sequences in trans and that most but not all class I genes encode a suitable donor peptide. Further, despite the fact that this peptide is secreted into the ER as part of the signal sequence, its binding to HLA-E is dependent on the presence of a functional TAP complex. When the HLA-E sequence is examined for divergence from the classical class I sequences, one obvious difference is the N-terminal portion of the signal sequence. The sequence of what is the first ATG codon in classical class I has been altered, resulting in a signal sequence that is three amino acids shorter than the classical sequence, and the N-terminal-charged residue found in most leader sequences, a positively charged arginine in virtually all HLA class I (32), is replaced by a negatively charged aspartic acid in HLA-E. Our data imply that the changes found in this region of the HLA-E signal sequence were an important part of the direct evolution of this molecule, since the HLA-E signal sequence must have been formed to prevent self peptide binding, requiring nonamers with methionine in position 2 and leucine in position 9. The other two HLA nonclassical class I have more characteristic signal peptides, and, as shown, the HLA-G can provide peptide. HLA-F, however, lacks the typical first three amino acids, indicating, based on results obtained in the peptide-binding assay with the HLA-A3 octamer, that HLA-F does not provide HLA-E with suitable peptide. Our results demonstrate that HLA-E binds preferentially class Ia leader peptides, as opposed to other host proteins. All of the studies conducted in this report involved the HLA-E allele expressed in .221, including the AEH and E transfectants, since the DNA used to make these constructs originated from the .221 parent cell line 721 (3). There are, however, two common HLA-E alleles present in nearly equal frequencies in most populations, designated ER107, which is the HLA-E allele found in .221, and EG107, containing an arginine or glycine, respectively, at position 107 (14). Further studies have shown that these alleles are present at nearly equal frequencies in diverse populations and suggest that HLA-E has been under some form of stabilizing selection (33). This may suggest that there are functional differences between the two alleles that are being selected for in a variety of populations. If so, it seems likely that the difference affects a heavy chain interaction, since position 107 is located on a loop between β pleats in the α2 domain and is thus unlikely to affect peptide binding. This position could, however, influence CTL recognition (34) or, alternatively, could be distinguished by an unidentified polymorphic receptor ligand. A potentially important clinical consequence of this polymorphism arises from a previous observation that a significant percentage of unrelated marrow transplant donor-recipient pairs are mismatched at the HLA-E locus (14). In addition to those characteristics shared by most class Ib Ags (e.g., low allelic polymorphism), HLA-E shares several similarities uniquely with the murine Qa-1 Ag (15): 1) both molecules bind a very similar nonamer peptide derived from the leader sequence of their respective classical class I counterparts; 2) heavy chain binding to that peptide is dependent on a functional TAP molecule despite the peptides residence within a leader sequence; 3) both molecules have unique amino acid substitutions within the Ag-binding site at highly invariant positions, presumably facilitating such peptide binding (15); and 4) both genes have essentially similar qualitative and quantitative expression patterns (3, 15). While a complete understanding of the function of HLA-E is pending, an interaction with CTL seems possible based on these parallels. Qa-1 has been shown to be directly involved in an alloreactive CTL response (17) and has been implicated as playing a role in the recognition by CD8+ T cells of CD4+ T cells expressing specific TCR Vβ determinants (18). Human CD8+ CTLs specific for TCR Vβ expressed on autologous CD4+ CTL have also been described (35). Although the failure of W6/32 to inhibit lysis by these cells would indicate HLA-E is not involved, the strong parallels between these systems suggest that further examination with HLA-E specific reagents may be warranted. Another apparent possibility for HLA-E function is a direct interaction with NK cells, as has been demonstrated for the classical class I molecules (36, 37, 38) and for HLA-G (39). In this regard, the results reported here may have significant bearing on experiments using the .221 cell line. Several recent studies that tested the HLA specificity of NK clones have used .221 cells transfected with various HLA alleles to distinguish the ability of class I variants to interact with NK receptors. While HLA-E is present in .221 but not expressed on the cell surface, our results demonstrating that HLA-E assembly and surface expression is induced in HLA-transfected cells may bring important new light to these studies. The fact that many but not all (e.g., HLA-B27) class I Ags induce such expression when transfected into .221 might further complicate the interpretation of certain results. Indeed, if peptide specificity of class I-NK receptor interactions is important, as suggested (40), a second level of complexity could be introduced by our observation that at least 5 distinct donor peptides (from HLA-A2, -B65, -Cw04, -Cw15, and -G) can bind HLA-E. Although the limited structural variation of HLA-E suggests that it is unlikely to recognize the diversity of NK receptors that have been shown to differentiate between distinct class I alleles (38), heretofore undescribed receptors or the ubiquitous CD94 NK receptor (41) should be suspect for interaction. With this possibility in mind, it should be noted that the functional interactions of HLA-E need not be limited to NK cells, since subsets of both αβ and γδ T cells express NK surface receptors (42). Our current focus on HLA-E function is directed toward such possibilities. Although it is clear that a transporter of peptide into the ER is the predominant source of peptide bound to class I molecules (5, 6, 7), several questions remain unanswered. Among these unresolved issues is the mechanism of peptide efflux from the ER back to the cytosol (43). Although peptides derived from signal sequences have been shown to bind class I in a TAP independent manner, there are a small number of TAP-dependent exceptions, including the peptide derived from the signal sequence of Dd/Ld in association with the class Ib molecule Qa-1 (17). This TAP dependence may be due to recycling of peptides too long to effectively bind class I from the ER back into the cytosol by an ATP-dependent but TAP-independent process (31), followed by processing and reentry into the ER in a TAP-dependent manner (44). Our results suggest that the majority of peptides bound to HLA-E are class I signal sequence-derived nonamers and that little if any other peptides are bound. The source and TAP dependence of bound peptides suggests that peptide loading into HLA-E is directly linked to classical class I biosynthesis and TAP interaction. In this regard, HLA-E can be immunoprecipitated with TAP antisera under conditions used to demonstrate classical class I-TAP interactions (N. Lee and D. E. Geraghty, unpublished observations). These considerations raise the possibility that HLA-E peptide binding and surface expression is necessarily strictly regulated by the expression of other class I, a possibility consistent with a direct immune interaction of surface HLA-E. It may also be relevant that HLA-E is expressed coordinately with class I, including all cells expressing classical class I (45) and in placental cells expressing HLA-G (A. Ishitani and D. E. Geraghty, unpublished observations). Since HLA-G and classical class I are under distinct transcriptional control, the most effective means of controlling HLA-E expression may be at the level of peptide binding and surface expression. The possibility that HLA-E is directly involved in TAP-class I interactions as part of the class I assembly process is not ruled out by these considerations nor is it mutually exclusive, although it seems less likely if HLA-E does in fact have a direct interaction with surface ligands. The picture that has thus far emerged from both human and mouse nonclassical class I Ag expression and function is that each gene may be adapted to perform a unique role, probably species specific (46). However, the similarities between HLA-E and the murine Qa-1 molecule may provide an exception to this interpretation. If so, this raises the possibility that a nonclassical class I molecule performing an overlapping or similar function exists in other mammals. Such a molecule would likely bear little more resemblance to HLA-E or Qa-1 than the two molecules do to one another. However, at least two structural features of such a molecule can be predicted. One requirement is that the signal sequence of the equivalent nonclassical molecule does not contain the motif derived from that species’ classical class I molecule. A second feature is the presence of unique substitutions in the Ag-binding site, substitutions that would facilitate restricted binding of a nonamer from the classical class I signal sequence. Two characteristics of expression can also be predicted, as both ubiquitous expression and a much lower level of expression, as compared with the classical class I genes characteristic of both HLA-E and Qa-1. It may be useful to note that a gene with exactly such characteristics exists in the dog (47). Studies of the nonclassical class I Ags in mouse and human are now demonstrating many distinct roles for these molecules. Further studies will no doubt reveal new insights into immune function directly involving the nonclassical Ags but also promise to provide a more complete understanding of immune mechanisms involving the classical class I Ags. We thank Dr. John Hansen for his support during the initial stages of this work. We thank Dr. Thomas Spies for cell lines, and both Thomas Spies and Glen Grandea for their many helpful discussions. We also thank Dr. Veronica Groh Spies for helpful advice about Ab production, Dr. James Blake for providing some of the synthetic peptides, and Dr. Natalia Dorofeeva, Lin Zhao, Joe Sundstrom, and Alison Wallace for technical assistance. D.E.G. thanks William Bjornson and Sunami Fujii Bjornson for critical support during the preparation of this manuscript. D.R.G. thanks Dr. John R. Yates III, for advice about microcapillary separations, Dr. Jeffery Shabanowitz for helpful discussions regarding low level peptide sequencing, and Dr. William Loyd of Finnigan Corporation. ↵1 This work was supported by the Bristol-Myers Squibb Pharmaceutical Research Institute (H.M.), by National Research Service Award Fellowship AI08911 (to N.L. ), and by National Institutes of Health Grant AI38508 (to D.E.G.). ↵2 These authors share equal credit for senior authorship. ↵4 Abbreviations used in this paper: ER, endoplasmic reticulum; endo H, endo-β-N-acetylglucosaminidase; rpHPLC, reversed-phase high-performance liquid chromatography; MS, mass spectrometry; CAD, collision activated dissociation; LCL, lymphoblastoid cell line; TFA, trifluoroacetic acid. McCormack, A. L., P. C. J. K. Eng, A. Y. DeRoos, Rudensky, J. R. Yates, III. 1995. Microcolumn liquid chromatography-electrospray ionization tandem mass spectrometry: analysis of immunological samples in biochemical and biotechnological application of electrospray ionization mass spectrometry. P. Snyder, III, ed. American Chemical Society Symposium Series: 619A 207 American Chemical Society, Washington, D.C.